To promote the release of his new LP ‘Low In High School’, Morrissey is opening two pop up shops, one in London and the other in LA. From 8am on Friday the 17th November to the 19th, in the Provender Building in Camden market, you will be able to get “exclusive” stuff. There will also be an LA one, time unconfirmed. But you probably came to this article for the Joey Barton bit. 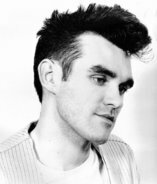 So: the new video for Spent the Day in Bed involves Morrissey being wheeled round in a chair by footballer Joey Barton, one of the few people to be as mouthy and dubious as Moz himself. There’s also a band playing and him singing, because of course.